This photo of the main street of Campbell River in the 1950’s reveals the aftermath of a sou’easter blowing through, typical for Campbell River in the late fall, winter and spring. You can see the driftwood being thrown up onto the roadway in front of the Van Isle Theatre. These were the days when the roadway was also the shoreline. A farm tractor with a push blade was used to push the logs to the side. View from current location of City Hall, of the home belonging to Dr. Howard Jamieson, Campbell River’s first doctor. The home was built in 1914 and was located approximately at present day 984 Shoppers Row. It was destroyed by fire a few months after being completed. With cooler temperatures and shorter days, September is often the month when we return to routine and dabble in those winter pursuits. This year, perhaps a result of our long dry summer, it appears that we were more than ready to catch up on indoor activities. This was certainly the case at the Museum’s Archive Research Centre with researchers working on topics such as environmental property assessments and family history to staff catching up on cataloguing new material. One interesting new addition to the archives is a number of FDP (Forestry Development Projects) newsletters from the late 1930’s. As I was cataloguing the newsletters I was once again struck by how often history seems to repeat. Similar to recently announced government work projects, in the 1930’s a number of Forestry Development Projects were undertaken to provide employment undertaking improvement projects throughout B.C.’s parks. Unlike our current downturn though, the “dirty thirties” resulted in vast numbers of homeless and unemployed and the FDP camps included accommodation and meals as well as work. 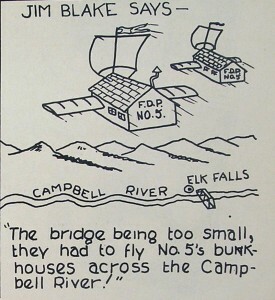 One such camp (FDP Camp 5) was located at Elk Falls Park. Full of useful tips and news the newsletters provide an interesting glimpse of these bygone camps. 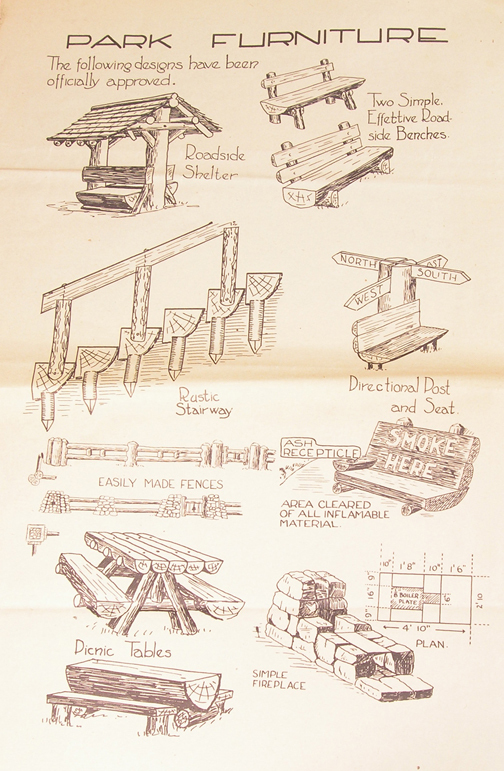 One edition features a full page spread on “officially approved” camp furniture, the style of which bares a resemblance to the park structures in use today. Another features photographs of the recently completed stairway at Elk Falls. Life in camp wasn’t all work though as reported in one of the newsletters, “Anyhow, Bill, from what I can gather, you fellows around Campbell River are more interested in matrimony than newspapers. The reports which periodically trickle through to our editorial ear claim at least three engagements with marriages in the offing”. According to the newsletter in February of 1939 local author Roderick Haig-Brown paid a visit to the FDP camps during which he become familiar with camp conditions. Later Haig-Brown would draw on these experiences when writing “On the Highest Hill” which is set in that time period. A delightful find these newsletters come to us from the local high school (Carihi). Rather than end up in the re-cycle heap we are grateful that Carihi staff took the time to bring them into the Museum were they can be viewed in our Archives Research Centre. The Archives Research Centre is open Tues to Fri from 1pm to 4pm. Please see www.memorybc.ca for a complete listing of our archival holdings.